Launched in January, Blockchain Reaction offers a distinct kind of Bitcoin gaming—one that is completely based on skills and not a hint of luck. 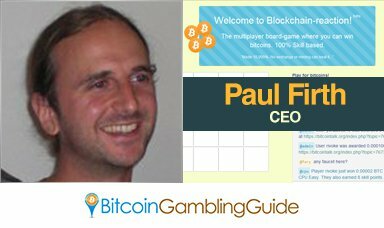 Paul Firth, CEO of Wildbunny Ltd and developer of this Bitcoin game, introduced his own take on the classic Chain-reaction game and shared his plans for this brand in the Bitcoin gambling market. Blockchain Reaction. Can you tell me more about it? Blockchain Reaction is a multiplayer board game where you can win bitcoins by using your skill alone to defeat other players or the CPU player. It is based on an old game called Chain-reaction, sometimes known as Atoms. This is the only online multiplayer version of the game in existence. It has been enhanced with a handicap system based on that of the ancient Chinese game ‘Go’ so that new players can play experts fairly. What makes Blockchain Reaction unique from the other Bitcoin gaming brands? Blockchain reaction is one of the only games where you can win bitcoins with no luck involved at all. Your skill at playing the game is the only thing which influences how much you can win. Online gaming has already extended to mobile devices. Is your brand compatible with various platforms? Yes, it has been designed to have a responsive web layout so it will run on mobiles as well as desktops. You need an internet connection to play. Given the distinct nature of the game you offer in the Bitcoin market, what have been the challenges that continue to affect your business operation? Primarily marketing. I am a developer by trade, not a marketeer so marketing techniques do not come naturally to me. Blockchain Reaction will be turning a year old in a few months. What are your plans for it in the next months or years? Continue to market Blockchain Reaction, and hopefully launch a new alt-coin exchange where there will be no trading fees forever. Speaking of altcoins, how much do you think cryptocurrencies will affect our lives? It has the potential to be hugely disruptive. I believe either cryptocurrencies will replace all traditional fiat currencies, or all governments will ban it outright. What are your thoughts on the growth of Bitcoin casinos and gambling sites? It’s already a huge industry and is growing all the time – but there is uncertainty around the corner when countries finally classify bitcoin as currency, because then gambling laws will come into effect. Talk to the Bitcoin gambling community now. What would you want to tell them? If you’re bored of putting your bitcoins in the hands of a random number generator, come check us out! The game is very addictive and you can play for free as well! Perfect! Thanks Paul for this opportunity and all the best with Blockchain Reaction.